Jenny & Tyler are an acoustic folk-pop duo whose live performances strike a rare balance of intimacy and intensity. They share their songs, their stories and their lives with a candor that captivates, inspires and transcends age and cultural divides. Regardless of background, their music hits closest to home for people who are wrestling with faith and searching for answers in an uncertain world. Acoustic guitar, mandolin and the kick-drum of an old suitcase drive catchy melodies to support thoughtful lyrics as Jenny & Tyler chronicle lives marked daily by love, joy, loss, doubt and redemption. Their blend of driving, percussive folk-pop rings of Mumford & Sons and Nickel Creek, and at times echoes popular male-female duos such as She & Him and fellow Nashville darlings The Civil Wars. In a crowded industry glutted by banality, Jenny & Tyler stand out as true psalmists. Their music holds a mirror up to nature, culture and all the reckless passions of the human heart and points ultimately toward a Creator. Their songs mark them as modern day contemplatives and troubadours, rooted in age-old wisdom set to new melodies. After meeting on bus in college, Jenny & Tyler began collaborating on music through a campus ministry at the University of Delaware. They first took the stage leading songs at the campus ministry, learning about each other while practicing in stairwells, talking tea over breakfast, and writing music. Years later, they found themselves at the altar again, this time as man and wife. Much like their contemporaries The Weepies, the sweetness of Jenny & Tyler’s story is palpable and disarming in the best way. It gives even the most cynical of listeners renewed hope that true love exists. Part of what makes them work is how their differences—both personal and musical—complement one another: she provides roots and he provides wings. Musically, Jenny’s wafting soprano is akin to Sara Groves or Leigh Nash, while Tyler’s grounded baritone vocals bear a striking resemblance to Charlie Fink (Noah & The Whale) or Mat Kearney. Together they form a thoughtful fusion, a balance between gravity and levity, resulting in sweeping harmonies full of yearning and a burgeoning call to life. Faint Not reinforces themes familiar to fans who have followed Jenny & Tyler since their beginnings. It voices spiritual longings and asks questions from a place of honesty and humanity while echoing a tireless invitation to listeners to engage the tensions of the gray areas of life and to bring it all into a dialogue with God. Instead of glossing over personal and global problems, Jenny & Tyler wrestle with issues like poverty, injustice, and apathy, starting with their own hearts. The success of Faint Not catapulted Jenny & Tyler into a new season of busyness. Thrilled with the opportunities brought by success, Jenny & Tyler seized nearly every opportunity but consequently found themselves at the point of physical, emotional and spiritual exhaustion. The season of recuperation and reflection that followed was the fertile ground for crafting their latest full-length album, Open Your Doors (2012), produced by Mitch Dane (Jars of Clay, JJ Heller, Caedmon’s Call). The narrative arc of the album invites listeners to a place of rest—a space to voice their wonderings, lay down their burdens, and drink-in beauty, comfort and peace. After a hectic season, this call to stillness was just what Jenny & Tyler needed to hear. Whether reveling in moments of beauty too rich for words (“Skyline Hill”) or struggling to let oneself be loved (“You Keep On Loving Me”), Jenny & Tyler give new words to universal experiences. In contrast, “Fear Thou Not” arrives with driving, percussive force in both music and lyric. It’s a song that rattles the bones and bolsters the spirit, war and joy set to music, a solid rock rising out of a tempestuous sea. Their fresh arrangement of the old hymn “See the Conqueror” comes to life richly and organically. Its unstudied air is evocative of and honors the leaders in the new-old-hymn movement, such as Sandra McCracken and Indelible Grace. The album comes to a close in lullaby form with the instrumental piano song “Selah” echoing the album’s theme of discovering and entering into a place of appointed rest. 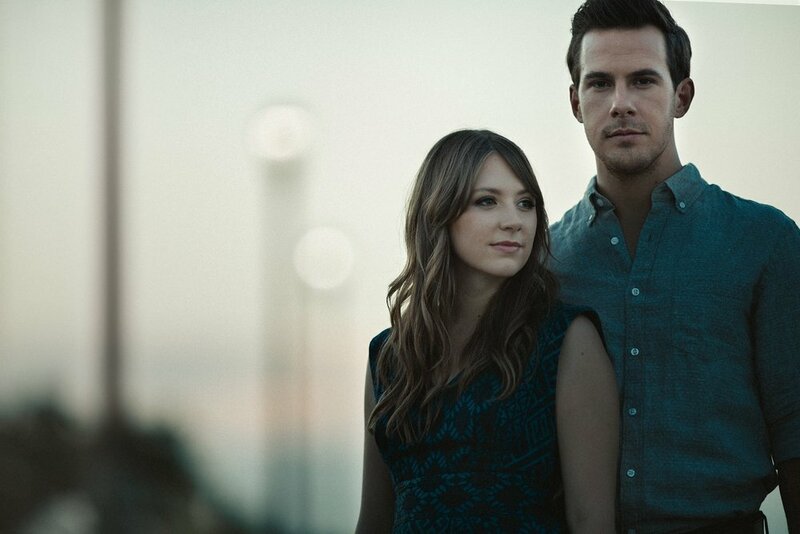 Indie duo Jenny & Tyler don’t merely want to tell a good story; they want to live one. Jenny & Tyler are committed to live a life of compassion and justice, as evidenced by the release of their charitable covers album,For Freedom – A Covers EP. Consisting of songs from U2 to Smashing Pumpkins to Simon & Garfunkel, the project supports the work of International Justice Mission, a non-profit organization dedicated to ending human-trafficking throughout the world. Jenny & Tyler continue to tour in support of Open Your Doors & For Freedom.